Wondershare DVD Slideshow Builder Deluxe is the easy-to-use yet powerful DVD photo slideshow software. With it, you can combine your photos and video clips into DVD slideshow with music and 2D/3D transition effects for sharing on TV, Youtube, iPod and so on. Hollywood styles are also pre-designed for automatic movie slideshow making. Using the software is very easy. 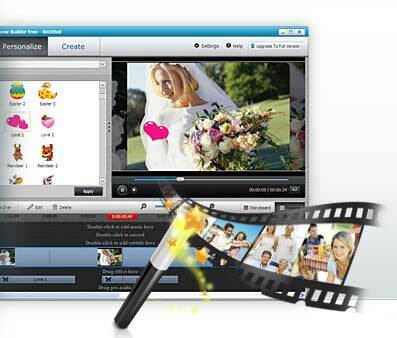 Just import photos, video clips and select a style. You can make professional family / friends video by just few clicks. I am pleased to announce that Wondershare will provide 10 free licenses of “DVD Slideshow Builder Standard” to TechTin.com readers. Actual price of this software is $39.95 but you can get it absolutely free. Just comment below and use a valid email address. We will send license key to your email address. Also key will be generated on your name and email ID. I will also appreciate if you tweet this post on twitter and share on facebook. UPDATE: Winner of the contest announced. Please visit below link for winner’s list. I don’t know if I get the license for this exellent softwarte, But will be glad to have it if it is possible, thank you. Wondershare DVD Slideshow Builder , very best Slideshow builder software, good to get one. This is one of the slideshow builders that you don’t wanna miss. Compared to other products that are bloated this one is easy to use and comes with Advanced and Standard options. Advanced options offer videos to be attached to the slideshow. You can also combine “standard made slideshow project” into a custom “advanced made slideshow”. Do count me in this a great application for anybody to keep memories in dvd/video format. this is an amazing software, waiting for the license.